The historic Webster House has been transformed from a school to a beautiful shopping and dining destination. It stands next to the modern Kauffman Center for the Performing Arts in the Crossroads Arts District of Kansas City, Missouri. One of my favorite buildings to photograph is the Webster House, formerly the Webster School. It’s in the Crossroads Arts District of Kansas City, Missouri. It’s a beautiful work of art, designed in the “Richardson Romanesque” style. What a grand place it must have been to attend school there! It’s lovely inside and out with fabulous interior wood woodwork. The school officially opened in 1886 and then closed in 1932. It was restored, opening in 2002, as a beautiful dining and shopping location. The Webster House has a beautiful bell tower, which is a reconstruction. The original was removed after another school’s bell tower fell during a tornado and caused the death of fifteen students. I like to meet friends and family at the Webster House for lunch or dinner, served in a couple of lovely dining rooms, which were once school rooms. Behind the Webster House are the Kauffman Center for the Performing Arts and the Bartle Hall Pylons, architectural icons and modern additions to the Downtown Kansas City landscape. The Webster School was designed by the Kansas City School Board’s architect, Manuel Diaz. Webster House is one of the oldest remaining public school buildings in Kansas City and is listed on the National Register of Historic Places. The Webster School was the last area school built with a bell tower on top. In 1886 a tornado caused the bell tower on the Lathrop School at Ninth and Broadway to crash into the school, collapsing the third and second floors into the basement and burying children in the debris. Bell towers were no longer permitted on top of schools after this tragedy. The old Webster School is now a restaurant and store. Here beautifully decorated trees display Christmas ornaments for sale. Beautiful cabinets that match the original woodwork of the old Webster School display jewelry for sale. History of the Webster House. History of the Kauffman Center for the Performing Arts. 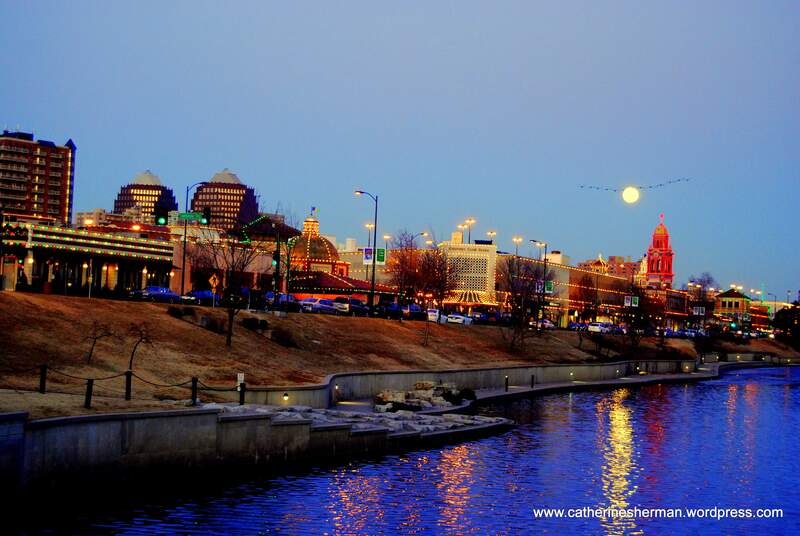 Geese fly in their famous v-formation against the backdrop of a full moon and the cheerful lights of the Country Club Plaza in Kansas City, Missouri. In this season, partly dedicated to consumerism, I’m posting this photograph I took this past January of the Country Club Plaza Shopping Center, one of Kansas City’s notable areas. The Country Club Plaza was the first shopping center in the world designed to accommodate shoppers arriving by automobile. J.C. Nichols, a residential developer of nearby upscale homes, designed the shopping center after European styles, especially those of Seville, Spain. More than thirty statues, murals, and tile mosaics adorn the Plaza, as well as major architectural reproductions, such as a half-sized Giralda Tower of Seville (the tallest building in the Plaza). Even though the Country Club Plaza was designed for automobiles, once you arrive you really need to park your car in one of the garages and walk from store to store. Pedestrians rule on the Plaza. Thousands of people live in condominiums and apartments nearby, and the Plaza is always teeming with activity. I drive by a lot, because my mother-in-law lives nearby, and it’s also on the way to the Nelson-Atkins Museum of Art. I’m not a shopper, though, so I seldom join the throngs, except to go to some of the great restaurants. A quaint restaurant on the Plaza with fantastic vegetarian food is Eden Alley, which is in the lower level of the Unity Temple. It also has a great people-watching patio outside. The trend in Kansas City now and elsewhere is to look toward another European design, and that’s mixed use –Situating housing areas, restaurants and stores in the same area, so that you can easily walk to a store or restaurant from your home. 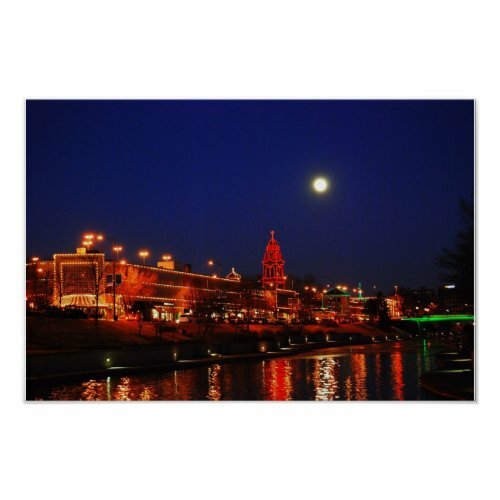 For more information about the Plaza — Country Club Plaza Shopping Center. Eden Alley Website. Cleaning out our closets we found a lot of great stuff. Maybe I should try on some of these jeans -- after I haven't eaten for a week. It’s garage sale season in our part of the world. No matter where you live, I highly recommend going through your closets and basement and setting up shop with what you find. You’ll learn a lot. About every five years, my friend Joy and I combine our sale items in her garage or mine. We recycle a lot of great stuff for low, low prices, including toys our kids thought they couldn’t live without like a barely used Xbox game. We never make much money but we have a good time. I’m not a big schmoozer, but I really enjoy the people who shop in my garage. I love to listen to their new uses for my treasures. We hear stories of why they are buying or who will get the items — college dorm, a son’s new home, daughter’s dining room, games to occupy visiting grandchildren, clothes for work and play. This year my daughter was a big help. She was motivated to prune her possessions as she prepares to move to California. One of the sad things was seeing all of her no-longer-wanted stuffed animals. Where did those all come from? And where did my little girl go? This year, it was so chilly and wet in early May when we had our sale that we almost cancelled. Even the blob in the lava lamp (for sale — only three dollars!) barely bubbled after a couple of hours of warm-up. Traffic was slow at first. We seriously thought of closing down, but we persevered. Joy jammed a new sale sign — bright green neon — in the wet earth on the corner. That brought a flood of customers. Sandy, a great friend, brought a great, rich cinnamon cake, which lifted our spirits….The hungry teenaged sons of one of our shoppers wanted to buy some of the cake, but Joy offered slices to them for free. Their embarrassed mother added a dollar to the money she paid for her purchases. We tried to give it back. Really, after a while it seemed ridiculous to charge for stuff we didn’t want any more. Here, just take this stuff. Enjoy! But giving away stuff isn’t easy, as we found out. People don’t like free, they want to pay at least a dime. It may be tarnished, but this heart touched my heart when a customer told a touching story. •Ten cents is more attractive than free. When no one would take a free push broom, Joy put ten cents on it. The next person bought it. Maybe people think free means worthless, but I think people want to pay something. •People can show you the value of your own discards. A woman holding my small heart box (only a dollar!) told us how a friend had given her a heart box full of heart-warming sayings that she could use whenever she needed one. Of course, I couldn’t sell our heart box after she told me that! •People will buy items they don’t have any use for if the price is low enough. We sold a marble clock that told the time around the world. I warned him that the batteries only lasted about a month. He didn’t care. •Some people insist on paying full price. Others want a discount no matter how cheap the item is. Still, everyone was gracious and polite, even the hagglers. •Most importantly, we learned how lucky we are. Near the end of the sale, a woman was looking through a rack of clothing, mostly my daughter’s. She held a pair of jeans to her hips and laughed. She brought her choices to the card table, our command post. “You’re so nice to buy for your sister,” Joy said. Going, going, gone! Don't look too closely. You might see some cat hairs. I’m glad we stayed open. Sure, we like getting a little money for our decorating detritus, fashion faux pas and bikes ridden only a few times. But what we learned — or re-learned — was priceless. Lately, a lot of people have been grumbling in our local newspaper about how cheap people are who shop at garage sales, but Joy and I have learned how generous they are — and how grateful we are for what we have. I know that in the real world of everyday retail, there are a lot of grumpy and whiney people, but luckily so far they haven’t shown up in my garage. A shorter version of this post was published in the Kansas City Star on May 27, 2009. 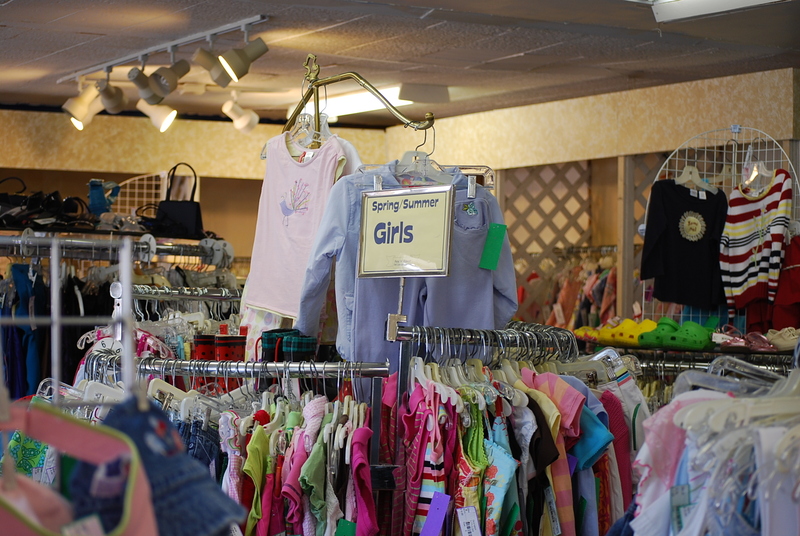 Children grow so quickly that there was always a market for their "gently worn" clothing. Now more and more women are buying "vintage" clothing for themselves. This is a Kansas City consignment store, which recently underwent a major renovation and expansion. Business is brisk! Couponing and shopping at sales are two obvious ways to save, but only if you buy items or meals you need. (Yes, need is a vague term, which is why our houses are full of stuff we thought we “needed”. ) These days, the half-life of a coupon seems to be about ten days, so some of the joy is gone. What happened to “No expiration date”? Of course, companies don’t last that long any more, either. Being a frugalista is much more than coupon clipping, though. It’s an attitude. You don’t have to spend a lot of money to enjoy life. You don’t need as much as you think. Sometimes, it’s a decision not to buy something or to find a different, cheaper way to do something you enjoy. Walk in the park. Kansas City has more than a two hundred miles of walking trails in stream-side parks with lots of access, so that’s easy for us. You can be a bird-watcher, cheap entertainment. I save the newspaper plastic sleeve and use it to clean out the cat box. (There’s no way you can make this fun, sorry.) Plastic grocery bags, if you’re still getting those, can line trash cans, but everyone knows that! Consignment stores. I’ve bought some great stuff there and sold some stuff, too. I'd be lost without my scissors. I have ten pairs, so a pair will always be near. Garage sales. Yeah, I know, it’s pain in posterior, if you conduct one yourself. However, sometimes it’s the only way to clear out your house. You can donate your stuff to charities, which is good, too, but a lot of that stuff gets dumped, unfortunately, because charities don’t have the resources to sort, display, store and distribute the zillions of tons of donated stuff. When someone invests a dollar for an item in your garage sale, they might actually use it. There’s also www.freecycle.org Conversely, you can get some great stuff at garage sales. We’re working on putting together a garage sale right now, because our neighborhood and several others around us are having one May 1-2. I’m going to try to enjoy it. Eat at home, including making your own espresso and lattes. I tried giving up coffee, mostly to avoid caffeine withdrawal in the morning, but I just couldn’t do it. I have a cheap machine, but I’m not picky about my foam, which is a good thing because the foamer is clogged. I order my coffee in bricks by the case from www.cafebustelo.com with free shipping in the U.S. on orders over $50. I order six months’ worth of ground coffee. I’m not hung up on grinding it myself. I’m happy if it’s strong and full of caffeine. Since recycling is the theme this week of Earth Day, I’m recycling another blog of a young frugalista from Kansas City who explains how she does it. She also has other great frugalistas on her blogroll. Carrie on the Cheap, a young frugalista. I’m recycling this blog post of mine because I forgot to put tags on it the first time around, Coffee, the Miracle Drink. I’m sure it’s still steaming hot, ha, ha. “Austere Times? Perfect” — Article from the New York Times on Frugalistas. What economic meltdown? What 700-billion-dollar bailout? Forget about it! These music videos about money will make your worries disappear! This shopper is happy with the low price on this skirt at a Kansas City consignment shop. It must be in the genes. My daughter works part-time at a Kansas City consignment store, just as her grandmother did for many years. As prices skyrocket, it’s trendy to give a second life to clothing that’s “gently worn” and still high style. Grandma is on a first-name basis with Saks and Nieman, but has supplemented her stylish wardrobe with pieces from Act II, a high-end designer store in Kansas City, where she worked part-time. 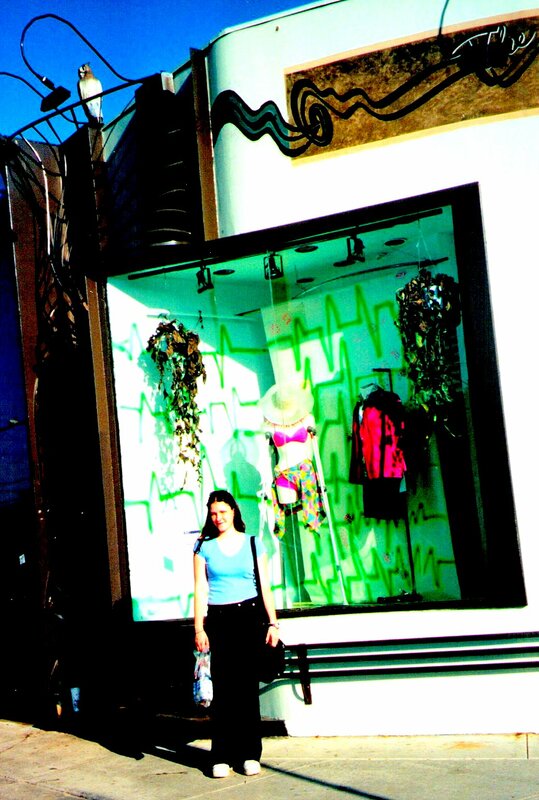 As a teenager, my daughter got started on her “vintage” clothing buying spree at The Wasteland on Melrose Avenue in Los Angeles in 2001. We were turned on to the area by my good college friend Jan, who also took us to the huge Aaardvark’s Odd Ark in Pasadena. (Yes, there are three As in a row.) My daughter was hooked! I did well myself, grabbing a great black leather motorcycle jacket for $11. On the Country CLub Plaza, a Kansas City Star photographer captures Mrs. L. in his lens for a Fashion Focus. There’s something about the word “vintage” that makes used clothes sound fabulous. The whole re-sale shopping experience has inspired new euphemisms for used, old, recycled, cast-off, outgrown, discarded and unwanted, but who cares? You can get some great stuff! My daughter’s consignment shop is mid-range and has been selling infant, children’s and women’s clothing and accessories for more than twenty years. She buys or uses her store credit to get a batch of “new” clothes a couple of times a month. She also consigns clothes she no longer wants. What she can’t consign she’ll take to a thrift shop. She’s so hooked on “vintage” fashion and its affordability, she barely thinks of buying new. In the Kansas City area, there are more than a dozen clothing consignment shops and dozens of thrift shops. Shopper outside The Wasteland consignment shop on Melrose Avenue in Los Angeles.